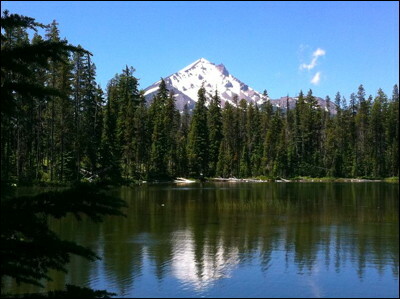 Mount McLoughlin in the southern Oregon Cascade Mountains as seen from Bernice Lake. In Takelma mythology, Mount Mcloughlin is the winter home of Acorn Woman, a powerful medicine woman. Her white hair is the shape of the snow. Each summer, as the snow melts, she comes down from her mountain, spreading her skin over the oak trees, bringing acorns to the people. Then she returns to her home in the fall with the first snow. Bill Hanley continues the white-hair-as-snow motif, writing in the late 1800s: "Mount McLoughlin ... looks like old John McLoughlin, always a white head, white hair streaming down his shoulders."